As a Seattle-born Norwegian-American, a woman once removed from the country of her father, my way back to my heritage has been through its food. I’ve always loved being Norwegian. Dressing up in a child-sized bunad for Syttende Mai parades in the Scandinavian-rich neighborhood of Ballard, eating the traditional feasts my grandparents would serve us on holidays, listening to the heavy and melodic accent that wove its way through my relatives’ speech–this was my upbringing and I loved it. But there’s a difference between the cultures in which we’re raised as children and the ones that we embrace as adults. I grew out of the black and red bunad. My paternal grandparents aged and passed on. The adults who kept their heritage alive so vibrantly and shared it with me faded into memory. The culture was no longer handed to me and it started to become peripheral. Grandma Agny’s death five years ago was a big turning point for me. I think I’ve mentioned before that I was going to ask her to start telling me her stories the day I got the phone call saying she had died. Grandma had been a young woman during the German occupation. She had a baby during the war, and she later uprooted her family and moved them to the United States. During my first trip to Norway in 2008, I became intrigued about her life–and the corresponding Norwegian history–and I wanted to know more. But I waited too long. Grandma’s death left me feeling a profound sense of loss, and in response I found myself seeking out elements of my heritage. And that’s where the food comes in. I still remember scanning the spines of books at Barnes and Noble shortly after Grandma’s death. I had come up with the idea of looking for Scandinavian cookbooks, as though the food between their pages might provide some comfort or solace. I found just a couple: Aquavit and the New Scandinavian Cuisine by Marcus Samuelsson and The Great Scandinavian Baking Book by Beatrice Ojakangas. My journalistic tendency to research things in detail came into play and I started seeking out as many Scandinavian cookbooks as I could find. Nordic cooking wasn’t as much of a trend in the U.S. then as it is now, and it took a little digging. But I wanted to know more, to understand more. And it was becoming clear to me that the way in was going to be through the food. As I explored my Norwegian heritage, I started Outside Oslo as a way to document what I was discovering. Although Scandinavian food had always been in my family’s repertoire while I was growing up, I was discovering it for myself. I was finally starting to get a sense of its origins, a sense of place. In the process, I was also beginning to understand my late grandmother more deeply. Things look a lot different now, five years later. My grandparents’ generation is fading fast, but the opportunity I lost when Grandma Agny died is not entirely gone. I will never get her back, but I’m learning more about my family and its history as my father helps me fill in the gaps. I’ve heard stories of my other grandmother’s life and created countless sweet memories with her as she’s taught me how to make sandbakkels, lefse, krumkaker, and other Scandinavian treats. And now it’s my turn to share the heritage that my grandparents so graciously shared with me. As I’ve studied Nordic food and worked it into what I cook at home, I know that the culture that my family brought with them to America will continue to live on. I have two kids of my own now, and they will grow up knowing the pleasure of eating pannekaker for an occasional dinner, the taste of sweet heart-shaped vaffler served with gjetost (Norwegian brown goat cheese), and all the warmth and love that surround meals shared together at the table. I never expected five years ago, in the darkest days of grief, that such richness was in store. But Grandma Agny had given me a gift by keeping her heritage alive and sharing it with me through all those Syttende Mai parades, traditional Norwegian meals, and with her generous heart. Today I’m still cooking my way through various Nordic recipes, sometimes returning to family classics, other times trying something new. Kitchen of Light: New Scandinavian Cooking with Andreas Viestad was one of the early books I discovered, and to this day it is one of my favorites. (I wrote a review a couple of years ago; despite receiving a copy from the publisher, I can say genuinely that this is an excellent book.) 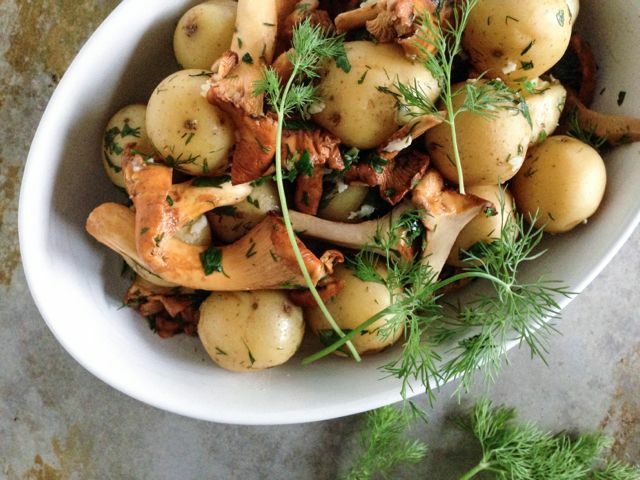 I had found it at the library while researching Scandinavian food, and this dish–chanterelles and potatoes with lemon and dill–was one of the first recipes I featured on the blog. 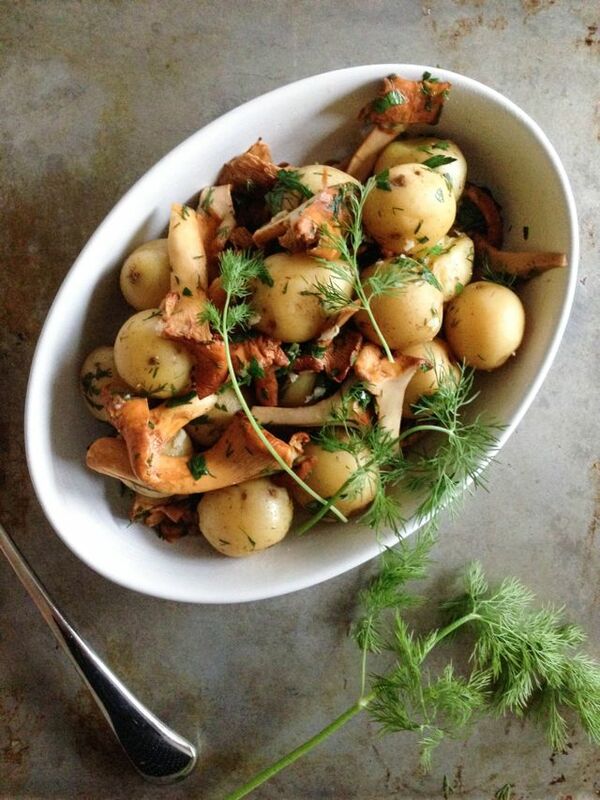 I made it this week for my parents and was reminded of how just a few simple ingredients can be so satisfying: just new potatoes and chanterelles, flavored intensely with lemon, garlic, and dill. The season for chanterelles is fleeting, but if you can still find some, I hope you’ll give this recipe a try. Cook the potatoes in a pot of salted boiling water until tender, then drain. 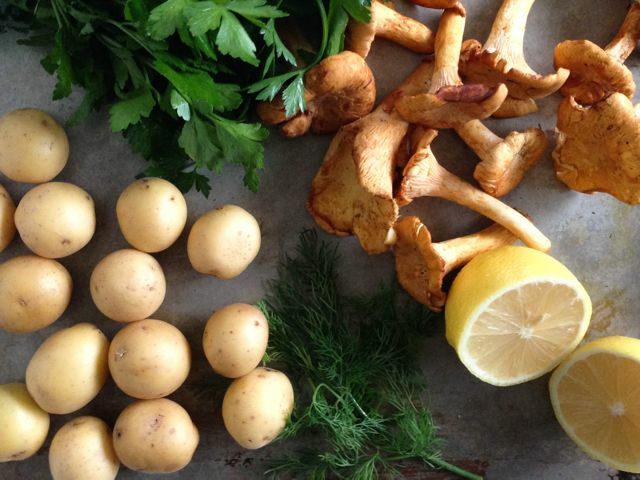 While the potatoes are cooking, trim the mushrooms and cut them lengthwise into halves or quarters, depending on their size. I like to keep them as large as possible, so I halve most of them, only quartering the really thick ones to make their size even with the rest. Melt the butter in a large skillet and add the mushrooms, stirring from time to time, until tender. Add garlic and a dash of salt, then cook for another moment just to take the edge of the garlic’s flavor. Add the mushrooms to the potatoes, making sure to spoon up all the flavorful butter from the pan. Add the dill and parsley, along with the juice of one lemon, and stir to combine. Add a little more salt if necessary, then transfer to a dish, garnish with dill sprigs, and serve.